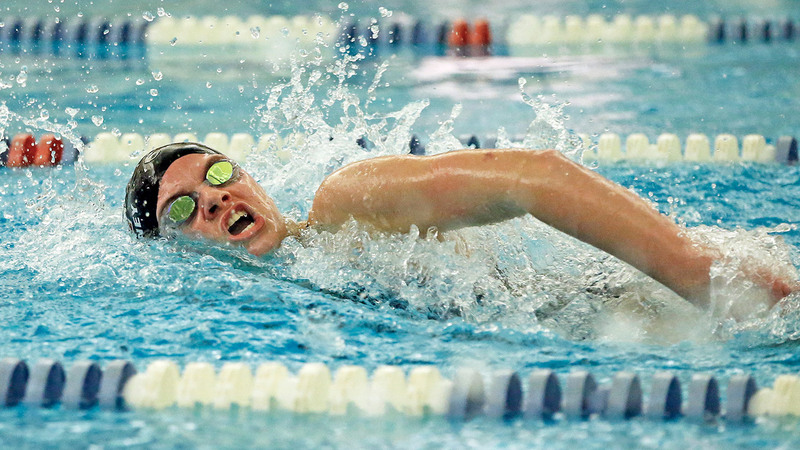 Four Cape Elizabeth swimmers set a school record in the 400-yard freestyle relay on Thursday. From left, Alicia Lawrence, Emily Ecker, Caroline Mahoney and Olivia Tighe turned in a time of 3:40.42. CAPE ELIZABETH — Olivia Tighe, a sophomore at Cape Elizabeth High, has had plenty of time to stare up at the record board that hangs from a wall inside the Donald Richards Pool. She grew up in town, started swimming in second grade and trains year-round with Coastal Maine Aquatics in addition to her hours with the high school team. On Thursday afternoon, Tighe was in the middle of a four-girl frenzied hug after she anchored a record-setting 400-yard freestyle relay to victory in a time of 3 minutes, 40.42 seconds. 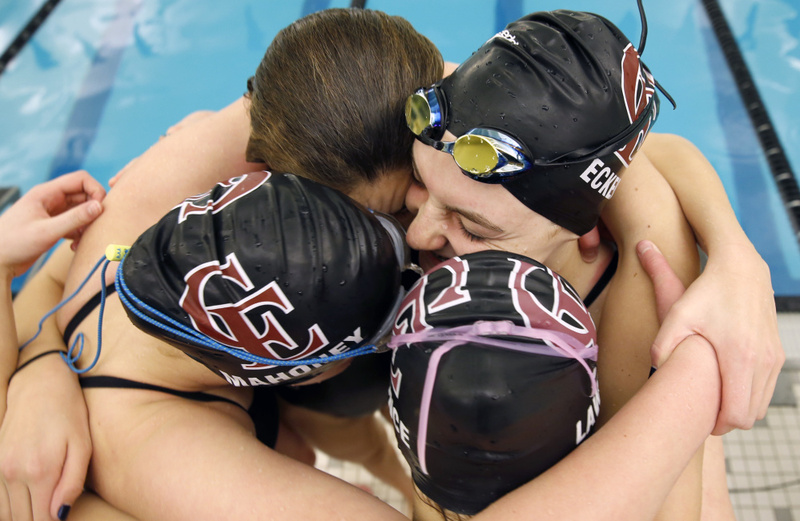 Classmate Alicia Lawrence led off the relay and freshmen Emily Ecker and Caroline Mahoney bridged the gap to Tighe, the defending Class B state champion in the 200 freestyle. Their time was faster than what the record board listed for school, pool and state bests, but – as the girls learned shortly after their swim – it had not been updated since Brunswick High lowered the state mark for the 400 free relay to 3:39.10 last February. So they settled for lowering their school and pool record of 3:40.84, which they had set shortly before Christmas against Bonny Eagle. The state record will have to wait. “For a second there, it was pretty exciting,” Lawrence said. “We can definitely get it at States,” Mahoney said. Caroline Mahoney was part of the Cape Elizabeth relay team that set a school – and pool – record in the 400-yard freestyle relay Thursday, with a time of 3:40.42. That Cape Elizabeth is challenging state relay records this early in the season, and entirely with underclass swimmers, should give the rest of the Class B field cause for concern. And the team is more than simply a fabulous foursome. Coach Ben Raymond had enough swimmers for eight 200 freestyle relay teams in the meet against Maine Girls Academy (formerly McAuley) last week, a 130-48 victory. Already, 22 girls have qualified for the Class B state meet, scheduled for Feb. 20 at the University of Maine’s Wallace Pool. In addition to the quartet mentioned above, six sophomores (Jade Lindenau, Hope Campbell, Casey Concannon, Maddy Culkin and divers Maggie Pierce and Kelsey Kennedy) have turned in times or scores among the state’s top dozen in Class B this winter. Senior Rose Baillie, one of three captains and currently ranked 10th in Class B in the 100 breast stroke, helped lead a chorus of “Happy Birthday” for Mahoney, celebrating her 15th birthday, after the 400 free relay ended Thursday’s meet. From top right, Emily Ecker, Alicia Lawrence, Caroline Mahoney and Olivia Tighe celebrate after setting a school record in the 400-yard free relay. Sean Flaherty, the coach at Maine Girls’ Academy, remembers a lot of the names on Cape Elizabeth’s record board. One of them, on the boys’ board, is his own, from when he swam for Scarborough High in 2001. The Capers were runners-up last February to Greely but this year figure to face their biggest challenge from Morse High in Bath.